Liverpool goalkeeper Simon Mignolet has told ESPN that he is relishing the prospect of fighting Pepe Reina for the No. 1 spot at Anfield. 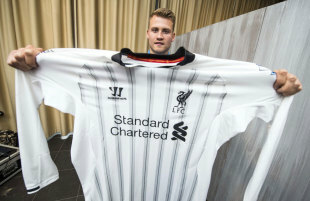 Belgium international Mignolet, 25, joined the Reds late last month from Sunderland, signing a five-year deal. His arrival has added to speculation that Reina could be on his way out of the club, with Barcelona regularly linked, but Reds boss Brendan Rodgers has insisted that he has no intention of selling the Spaniard. Mignolet, who has to compete with Atletico Madrid loanee Thibaut Courtois at international level, says it would be a positive if Reina does stay as he believes having to compete can only bring out the best in both players. “That’s always what has happened when there’s competition,” he told ESPN FC. “I’ve had competition in Sunderland and in Belgium with the national team. “It’s not only Pepe – there’s a lot of good goalies at Liverpool, like Brad Jones for example – and it’s not only the position of the goalie where there is competition. It’s every single position on the field. Mignolet has been impressed by the plans Rodgers and goalkeeper coach John Achterberg have in taking the club forwards. Even so, he is still adapting to life at Anfield and said he is finding it “hard to understand” Liverpool’s magnitude.